How can I find out about kayaking times and locations? Events details are posted on our Facebook Group. If you adjust your Facebook notification settings, you may also be able to get Facebook notifications when new events are added to the group. Expect to get wet! Wear non-cotton clothing and shoes that you don't mind getting wet. Bring a towel and a change of clothes too, in case you fall in. Protect yourself from the sun. Sunscreen, sun hat, and other sun protection is recommended. On cold days, bring waterproof clothes. A rain jacket and rain or ski pants work great to keep you dry while paddling. They won't protect from the cold water you if you fall in, though, so consider wearing a wetsuit or drysuit if you have one. Keep hydrated! Bring a water bottle to take in the kayak and extra water for when you get back. A contribution to offset our expenses. The recommended contribution is $5, but anything you can afford will be fine. If you can give $10, it will help keep the contribution optional for those who can't afford to pay. Snacks to share with the group. A type III life vest, if you have one. If not, there are usually enough extra life vests to go around. A carabiner clip to attach your car keys and other valuables to your life vest. If you will be bringing your phone with you, a waterproof, floating case for your phone will help protect it if you fall in. The most common meeting locations are Dan Foley Park and the Vallejo marina. But, we often find new places to Kayak and sometimes carpool to out-of-city locations. Meeting locations are announced on Facebook. Do I have to own a kayak or life vest? You do not have to own any equipment! Several group members generously bring extra kayaks, paddles, and life vests to share with the group. 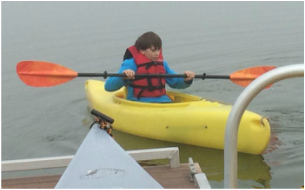 The group is free and open to all, but there is a recommended contribution of $5-10 at every kayaking meeting for those who can afford it, especially if you borrow our equipment or come to Kayak Katie's training sessions. The members who are absorbing these expenses can only afford so much. Member contributions are absolutely vital to keep the group going as more people join and our expense increase. What if I don't know how to kayak? That's OK! Kayak Katie is our volunteer trainer and provides beginner training at some of our kayak meetings. On the days that Katie is not training, just let us know that you are a beginner. Someone will be happy to show you the basics! 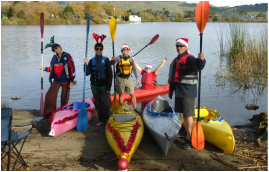 We are an informal, local group with activities in Vallejo, CA and surrounding areas.